Business Cornwall magazine visits St Austell- based printer, Nationwide Print, and discovers a business operating at the very top in its industry. There are many, many award schemes in the business world, and some mean more than others. But when a Cornish company wins one of the top accolades at the national PrintWeek Awards, it is worth sitting up to take notice. PrintWeek is the most-widely read printing trade publication in the UK and the awards are universally recognised as the top honour in the industry. In October, St Austell-based Nationwide Print returned home from the London cer- emony having won one of the most competitive and sought-after categories – SME of the Year. Nationwide Print, has won the final of the 2014 Print Week Awards. The category ‘SME Printing Company of the Year’, Nationwide Print were judged to be the winners from a panel of 25 judges for the highest accolade in UK print. Nationwide Print, has reached the final of the 2014 Print Week Awards. Nominated for ‘SME Printing Company of the Year’, Nationwide Print has been shortlisted along with four other companies for the highest accolade in UK print. Nationwide Print’s newest bit of kit – a Ricoh C751 green digital press. Perfect for short runs, last-minute requirements and next-day turnarounds, this total digital solution complements our existing litho press and prints to the same superlative standards – just in double-quick time. 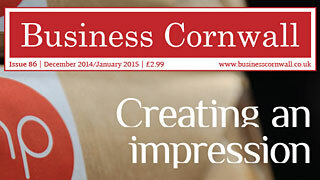 Nationwide Print was recently featured in Cornwall Today. Click the thumbnail to see the full article. 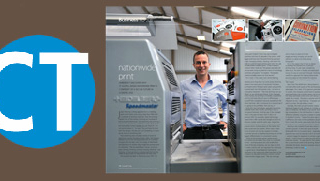 Nationwide Print placed in the top five of the 2010 Printweek SME Print Company of the Year Award. The winners of the 2010 Printweek Awards were announced in the Great Room at the Grosvenor House, Park Lane. Nationwide Print has installed 150 photovoltaic panels on its roof that uses natural sunlight to generate power. Click to view more. 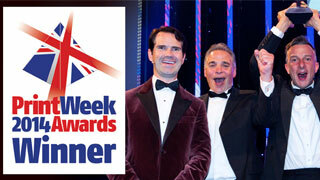 Nationwide Print: UK Environmental Print Company Of The Year! Find out about our latest major investments at the cutting edge of printing – t.co/8JwMGxrCYF t.co/9V0vdFu13P Time ago 8 Hours via Hootsuite Inc.
We are big fans of the #brandpublication for creating a sense of community and telling the story behind the product… t.co/qugJLKTGvv Time ago 1 Day via Hootsuite Inc.
Ohh this sounds interesting! Whose got their tickets for @PorthillySpirit? We love the sound of this new festival in North Cornwall… Time ago 4 Days via Hootsuite Inc.